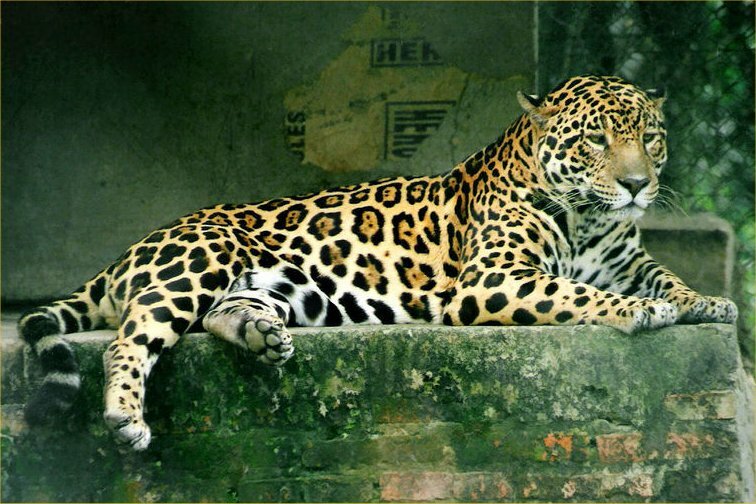 The base color of a jaguar’s coat is normally tawny yellow, but it can be reddish or brownish. It is covered in black rosettes with one or several spots in the middle of each rosette. The spots on the head, neck, and tail are solid black and its belly is white. A near-black melanist form of the jaguar, sometimes called a black panther can be seen on occasion. It is sometimes mistaken for the leopard, but the easy way to differentiate between the two is by looking at the rosettes. A leopard will not have small black dots in the center of his while the jaguar will. The jaguar is the largest cat in the New World. Its weight and size can vary considerably between 100-300 lbs and it is thick and stocky in build. Its jaws are extremely powerful and it has the strongest bite of any feline and can pierce turtle shells or armadillo plates. 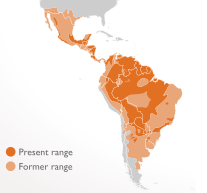 Dense rainforests or varying forested and open terrains extending from Southwestern United States and Mexico across much of Central America and south to Paraguay and northern Argentina. It is strongly attracted to areas with water and, as the tiger, loves to swim. The jaguar is the only Panthera species found in the Americas. Although thought to be nocturnal, jaguars are more accurately described as crepuscular and they may hunt during the day. They are one of the more energetic felines being active 50-60% of the day. Sometimes they can be seen lounging in trees. Being at the top of the food chain where it lives, it can take practically any animal it likes as its dinner. They regularly take adult caimans, deer, capybaras, tapirs, peccaries, dogs, foxes, and sometimes even anacondas. The cat will eat any small animal that can be caught but may also attack livestock. The jaguar stalks its prey and ambushes it rather than chasing it. It will sometimes carry large kills into a tree to protect it from other animals. It rarely attacks humans although it has been seen when the jaguar is either old, wounded, or (in captivity) scared or threatened by zookeepers. Jaguar females reach sexual maturity at about two years of age, and males at three or four. They are thought to breed throughout the year with the gestation period lasting 93–105 days. After breeding, the male and female separate and the female takes over. Females can give birth to up to four cubs, but normally she births only two. The mother ensures the cubs safety by keeping her distance from other males in case of infanticide. The young are born blind and remain that way for two weeks. Cubs are weaned at three months, but remain in the birth den for six months. At that time they leave the den and go with their mother to hunt. They will stay with their mother for one to two years before they leave to establish their own territory. They live 12-15 years in the wild and up to 23 years in captivity. The jaguar is an apex predator, meaning it is at the top of its food chain and has no predators in the wild. Panther onca onca: Seen from Venezuela through the Amazon. P. o. hernandesii: Known as the Mexican jaguar, it inhabits Western Mexico. P. o. palustris: Being the largest subspecies, weighing more than 300 lb, it lives in the Pantanal regions of Mato Grosso and Mato Grosso do Sul, Brazil, along the Paraguay River into Paraguay, and northeastern Argentina. 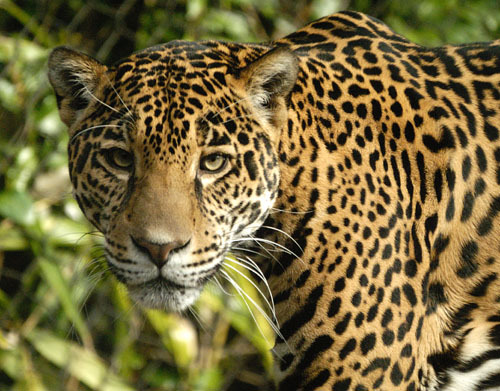 The IUCN Red List classifies the jaguar as near threatened. There are 12,000 to 17,000 jaguars in the wild. The major risks to the jaguar include destruction of its habitat through deforestation, competition for food with humans, and poachers.